The frenetic and colorful opening credit sequence lets you know, right up front, what you’re in for with #Horror. The directorial debut of Tara Subkoff, the movie had a limited theatrical and VOD release before being picked up by Scream Factory. It tells the story of a group of twelve year old girls who, during a sleepover, find themselves in the middle of a social media revenge plot being carried out by someone who wants to murder them, but not before they tear each other down. What, on the surface, appears to be an old-fashioned slasher of sorts winds up being an amalgam of different things. #Horror definitely has something on its mind, but it’s too chaotic to know exactly what that is. Without getting into spoiler territory, the movie tries way too hard to have a social commentary, but without characters worth latching onto. The aforementioned young women flip-flop constantly as characters, bullying each other to the point of crying one minute and then acting sorrowful and tender to each other the next. Sure, people can be inconsistent, but trying to replicate that in a movie seems ill-advised. At the same time, the movie attempts to have an over-the-top visual style, reminiscent of Edgar Wright, but without anything else to back it up. 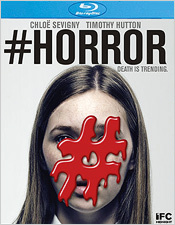 While #Horror shows the promise of originality at first glance, it fails in nearly every possible way. Yet, I still can’t help but feel that there’s something here for modern horror fans to embrace, if they don’t expect too much from the film. There are some beautiful locations on display and being set during the winter makes the movie infinitely more interesting to look at. Unfortunately, it’s still a bit of a chore to sit through. The Blu-ray presentation itself contains a beautiful, detail-soaked transfer with colors that really pop. Strong detail is abundant, particularly in tighter shots, and shadow detail is strong. Blacks are quite deep, and both contrast and brightness levels are spot on. At times, there’s some noticeable flicker, but it tends to blend into the fabric of the presentation. For the audio, there are two options: English 5.1 and 2.0 DTS-HD. The 5.1 track features strong, clear dialogue, as well as good use of sound effects. Surround activity isn’t abundant, but there’s some nice ambience and decent speaker-to-speaker movement at times. There’s even some pretty good LFE. Subtitles are also available in English and Spanish. Unfortunately, the only extra is the movie’s trailer. The concept of bullying in horror movies, or even movies about bullying, can be captivating and worth exploring, but not here. I would have been a little happier with less frenetic images, but that may just be the old man in me wanting something a little more slow burn out of a story like this. Either way, #Horror definitely isn’t be for everyone... if indeed it is for anybody.